Cape Cod have designed this stand alone flavor to fit in with their 40% Less Fat range of Chips, but used the same coloring profile as the regular Chips. This is fine, but it makes it look like there is a full fat version lying around somewhere, when it doesn't exist. For the Less Fat range, we would have gone for a different color to the top brush stroke to give it two base colors (maybe 40% less color), to differentiate it. The crunch was slightly inferior to the standard Kettle cooked Chips in Cape Cod's stable. No so that it affected your enjoyment of what is, after all, a healthier Chip (which is what we were telling ourselves as handfuls were consumed), because it is still snappier and crunchier than most regular Chips. 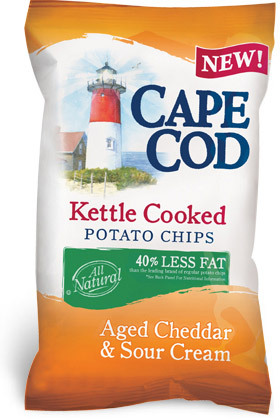 These were a little less oily than Cape Cod's standard Kettle Cooked Chips, having a drier feel to them. While the Kettle Cooked bubbles remained they were smaller - probably because they spent less time in the cooking oil. The surface had a slight dusting of lightly colored powders. For an All Natural Chip that is 40% Less Fat than "The Leading Brand", this little list of ingredients makes it all seem a little scary: Potatoes, Canola Oil, Dairy Whey, Salt, Cheese (Cheddar, Monterey Jack and Swiss [Cultured Milk, Salt, Enzymes]), Maltodextrin, Sour Cream (Cultured Cream, Nonfat Dry Milk), Onion Powder, Buttermilk, High Oleic Canola Oil, Nonfat Dry Milk, Dextrose, Vinegar Powder, Natural Flavors, Whey Protein Concentrate, Disodium Phosphate, Garlic Powder, Citric Acid, Yeast, Lactic Acid, Annatto Extract. Having said that, we would pick this pack every time over any full fat version, simply because the attempt to cram as much creamy cheese flavoring into the taste works very well. It is a highly cheesy Chip.